Donald Drummond was a remarkable builder who pioneered modern residential architecture in Kansas City, Missouri. He was a part of a small group of merchant builders in the United States who succeeded in building post-and-beam, glass-walled tract homes. In doing this, Don and his wife, Francie, promoted the virtues of modern indoor-outdoor living. Drummond built as many as 1,100 homes in the conservative Kansas City market. Drummond’s operation, which lasted from 1946 to 1964, was of average size for a central-states merchant builder. It was an education in engineering that informed his work and led to designs that were structurally expressive. Born in Chicago in 1915, Donald H. Drummond moved to California at age 3. He grew up in La Jolla, “knowing at age 6 that one day I wanted to be a builder.” After attending Cal Tech and Stanford, where he graduated with a mechanical-engineering degree in 1937, he began working for Kaiser, building Shasta Dam. Drummond met his future wife, Frances Woodruff, at Stanford. After marrying in the early 1940s, he worked as chief engineer for Harland Bartholomew Associates, overseeing construction of more than 20,000 units of defense-worker housing, mostly in Virginia. Drummond also built flat-roofed designs known today as “flatties.” These designs came from highly successful Bay Area builder Earl W. “Flat Top” Smith. “I was interested in them because of the framing,” Drummond said. “Being an engineer, I liked a beautiful structure.” Coincidentally, the famous Bay Area modern home builder Joseph Eichler also borrowed from Smith, building two homes based on Smith designs before hiring his first architectural team, Anshen+Allen. Unhappy with these early designs, Francie insisted they hire an architect. “I had a smart wife,” Drummond bragged. Starting in 1949, the Drummonds’ projects were designed by Kansas City architect David B. Runnells. Runnells had attended the Cranbrook Academy of Art in Michigan and had worked for Finnish architect Eliel Saarinen, a patriarch of American modernism. Runnells’ first design for Drummond, the Revere Home, was a 1,300-square-foot split-level with post-and-beam construction design. It was honored as part of the Revere Quality Homes Program, intended to advance “better architect-builder relations and the general improvement of the quality of speculatively built houses.” In 1952, Joseph Eichler would receive the same honor. In 1950, Drummond’s Revere Home was published in Architectural Forum and Life magazines. Eichler’s first architect-designed house also appeared in both articles. Runnells designed a second home in 1951 for Drummond, a 1,000-square-foot modern Cape Cod. Locals have dubbed it the Minimum House. Post-and-beam construction would become a Drummond trademark. 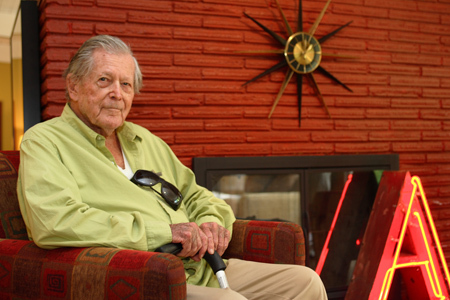 Runnells would go on to design a lavish home for Don Drummond’s personal use in Mission Hills. Drummond’s most popular plan, however, was his most conservative, the Home for 52 and You. From the street, the “52” resembled a contemporary ranch, with a front facade of board-and-batten pecky cypress siding. The rear and interior were more explicitly modern. The signature vaulted post-and-beam ceiling was there, as well as a surprising expanses of glass that opened onto a backyard living area. In 1954, Drummond participated in the U.S. Gypsum Research Village project in Barrington, Illinois. He teamed with St. Louis architect Harris Armstrong. Also participating were A. Quincy Jones and Eichler, who collaborated with another builder on site to erect a steel house that predated their X-100 project. Drummond and Armstrong’s house was a conventionally framed wood-and-brick structure. It was a simple rectangle with a gabled front, enlivened with an attached carport, trellises, and garden walls that created outdoor rooms. The concept was to enlarge the plan by making the interior rooms extend into the outdoor spaces. In 1955, Drummond participated in a national program sponsored by the National Association of Home Builders and NBC’s Home television show. The program, dubbed “The House That Home Built,” challenged builders across the country to build a modern home designed by California architects A. Quincy Jones and Fredrick Emmons. Jones and Emmons had been working for Joseph Eichler for several years, and the plans were refinements of that earlier work. Eichler paid for the plans, and NBC commissioned a model. 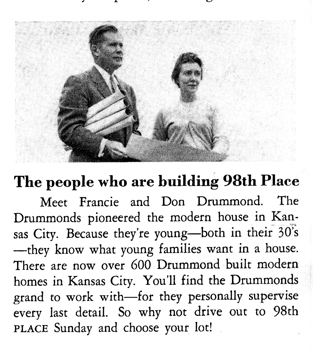 Drummond completed the home and actually appeared on national TV twice to promote the program, once in New York and once from Kansas City when the home was done. Drummond went on to build additional versions of the plan. It was at that point that the Drummonds visited Eichler homes and toured several of their subdivisions. “We called on them, because they were a volume builder, they had some good techniques,” Drummond said. “We saw their plans, and they told us who they had working for him. We called [Jones], and he went to work for me.” After investigating several new design options, the Drummonds settled on a plan that was derivative of an unbuilt steel house that Jones and Emmons had designed called the Homestyle Home. In 1956, Don and Francie branded the new wood post-and-beam design the Castilian, the biggest and most lavish plan that they would build. The Castilian was a quintessential Jones and Emmons H-plan, with terraces facing front and back. This addressed the criticisms that earlier Eichler H-designs had unceremonious entrances. The Castilian proudly turned its broad gable and its larger wood screened entry terrace to the street, foreshadowing the Eichler atriums. Drummond built modern homes until 1964, when, during a housing downturn, he moved to California. He and Francie built a few old-world-style houses there. The two settled in Carmel, California, and began traveling to South America to pursue their new passion, growing orchids. In 1985, they began growing orchids commercially in ten greenhouses. Francie lived in Carmel with Don until her death on March 23, 2005. In 2006 and again in 2007, Don Drummond returned with his children to Kansas City to celebrate the resurgence in popularity of his modern homes. Each trip was highlighted with a tour and a reception in his honor. The tribute of those weekends brought tears to his eyes when he said, “My only regret is that Francie is not here to share this with me.” Don Drummond died a few years later on December 23, 2011.